NDF –Bikol honors 55 Bikolanos revolutionary martyrs on All Souls Day. Karapatan – Bikol has recorded 55 cases of summary executions under Duterte administration from July 13, 2016 to October 12, 2018. 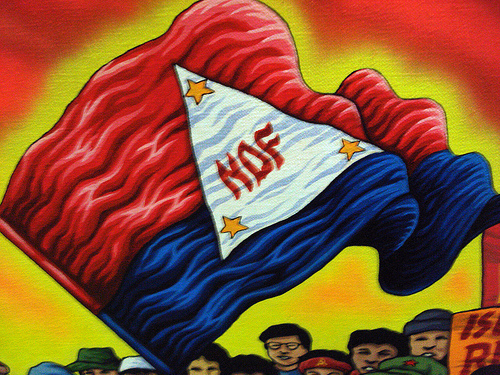 Flag of National Democratic Front of the Philippines. NDFP Photo. Legazpi City, [11.01.18] – The National Democratic Front – Bikol has paid a homage to its home grown 55 Bikolanos Revolutionary Martyrs who offered their lives on the cause of national democratic struggle this morning as the whole nation is celebrating the All Saints/Souls Day. “Iginagawad ng NDF-Bikol ang pinakamataas na pagpupugay sa lahat ng martir ng rebolusyong Pilipino sa Bikol at sa buong Pilipinas. Inspirasyon ng buong rebolusyonaryong kilusan ang mga nag-alay ng buhay para sa sambayanan sa pagsusulong ng makatwiran at makatarungang digma. Topping in the tribute as their martyred comrades were Alfredo “Ka Bendoy” Merilos, a member of Komiteng Tagapagpaganap ng Komiteng Rehiyon ng Partido Komunista ng Pilipinas [PKP-Bikol] and PKP Central Committee and a lady red warrior Kasamang Ems of Tomas Pilapil Command. According to the NDF-Bikol statement Ka Bendoy and Ka Ems are incapable of performing their ability to wage war as they are seeking medical help as Ka Bendoy was seriously ill and Ka Ems was wounded when they were liquidated by state troppers in Camarines Sur. Under the Rule 47 – International Committee of the Red Cross [ICRC] – Any person who is considered as hors de combat is a person who is no longer participating in hostilities, by choice or circumstance should not be attacked. The alleged circumstances surrounding the deaths of Ka Bendoy and Ka Ems are a blatant violations of the Geneva Convention, the statement said. From July 13, 2016 until October 12, 2018 the state-led human rights violations was documented in five provinces of Bikol region excluding Catanduanes. The youngest victim was recorded by Karapatan – Bikol was 9 years old from Cawayan, Masbate and the oldest was 71 years old from Caramoan, Camarines Sur.